Amazon today debuted an all-new touchscreen Echo device, which it's calling the "Echo Show," following a report from yesterday that said the company was gearing up to debut the new Echo as soon as today. As was expected, the Echo Show is a smart home speaker system that has all of the features of the basic Echo system with an additional 7-inch touchscreen. With the addition of a touchscreen, Amazon said that users will be able to watch video flash briefings and YouTube, see music lyrics, check on security cameras, swipe through photos, view weather forecasts, make to-do and shopping lists, and more. 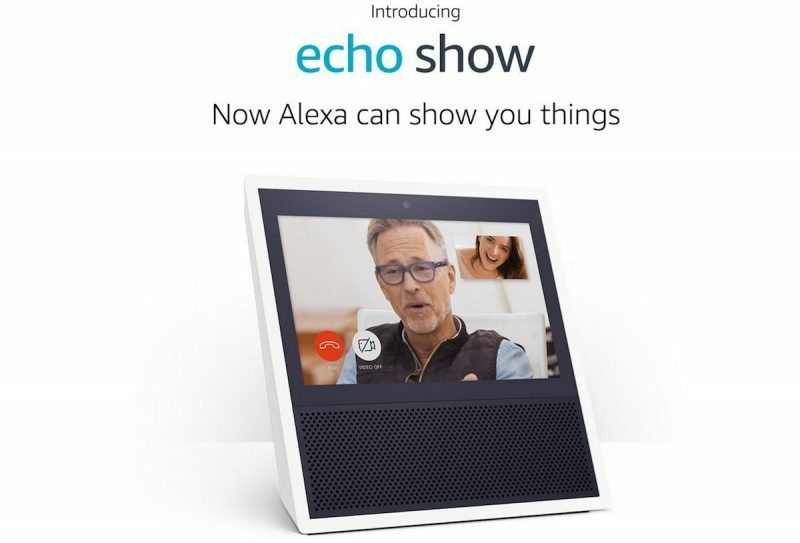 Far-field voice recognition, eight microphones, beam-forming technology, and noise cancellation allow users to be heard from anywhere in the room, as well as over loud music coming from the Echo Show itself. One of the biggest additions with Echo Show is a new video chat experience that allows users to make hands-free calls to friends who also have an Echo Show, or who use the Alexa smartphone app. A Feature called "Drop In" lets users quickly contact or send messages to other Echo Show devices to do things like let someone know it's time for dinner, or check in on a child's nursery. The Echo Show will connect to smart home products like Hue and Wink, and allow for simple daily tasks like timing food in the kitchen and catching up with the news. The Amazon Echo Show is the latest in a long line of Amazon smart home speakers, following the original Echo, Echo Dot, and most recently the Echo Look. While Amazon sits on top of the market for these voice-controlled speakers, more companies are looking to add similar products into their line-ups. This week, Harman Kardon teased the upcoming launch of a speaker with Microsoft's Cortana built in, with an aesthetic very similar to Echo. Apple has long been rumored to be getting into the smart home speaker market as well, with plans to launch a device that would be visually similar to Google Home and have deep Siri integration, as well as the usual Apple services like Apple Music and iCloud. Rumors about such a device began around this time last year, and Apple is now believed to debut the Siri smart speaker as soon as WWDC in June. Although a screen on the Siri device has not been mentioned in rumors, Apple senior vice president of worldwide marketing Phil Schiller recently mentioned that having a screen available suits more user-friendly situations than a device that exclusively uses voice controls. "So there's many moments where a voice assistant is really beneficial, but that doesn't mean you'd never want a screen," Schiller said. "So the idea of not having a screen, I don't think suits many situations." The Amazon Echo Show is available to pre-order right now in black and white for $229.99 and will begin shipping June 28. Those who purchase two Echo Show devices at once can save $100 off of the order with a special promotion that Amazon is debuting for the launch of the new speaker. Why would someone use this over an iPad with a stand and enable 'Hey Siri?' (or a competitor equivalent tablet)? Imagine if it was thinner and a bit more portable. They could call it, I dunno, a tablet or something. This all looks pretty familiar. Sony Dash, Chumby, etc. They're battery-less tablets in the form-factor of an alarm clock. They've been tried before, and they failed. I suppose Amazon's brings the difference of a voice assistant and an established and mature(ing) ecosystem. We'll see if consumers embrace it this time. I'm sorry but I just don't trust these kind of products. Why would I let an always listening device into my home? So corporations can eavesdrop 24-7 and market me even further than they already do? Same with those "security" companies that set up cameras and sensors all over your house. Only with those not only can they hear but they can watch you in the privacy of your residence at all times. Might as well leave your doors unlocked and windows open so everyone can check out what you're up to, or just invite the NSA or whatever other 3-letter agencies to set up shop inside. This day and age, nobody cares enough about their privacy anymore, and the higher-ups are taking notice and taking full advantage of the situation to exploit us in efforts to further their own ends.